It’s almost Valentine’s Day and for many people that means Date Night. But that can be challenging with kids. Sometimes you can’t find help or a babysitter when you need it. So, here’s our guide to navigate a family night out to celebrate Valentine’s Day. Be brave, be prepared—and have fun! Pick your restaurant wisely. Do some research and find one with a kid-friendly menu and a somewhat noisy environment to drown out outdoor voices that should be indoor voices. Eat early. This avoids the busy times and hopefully means you get your food faster. 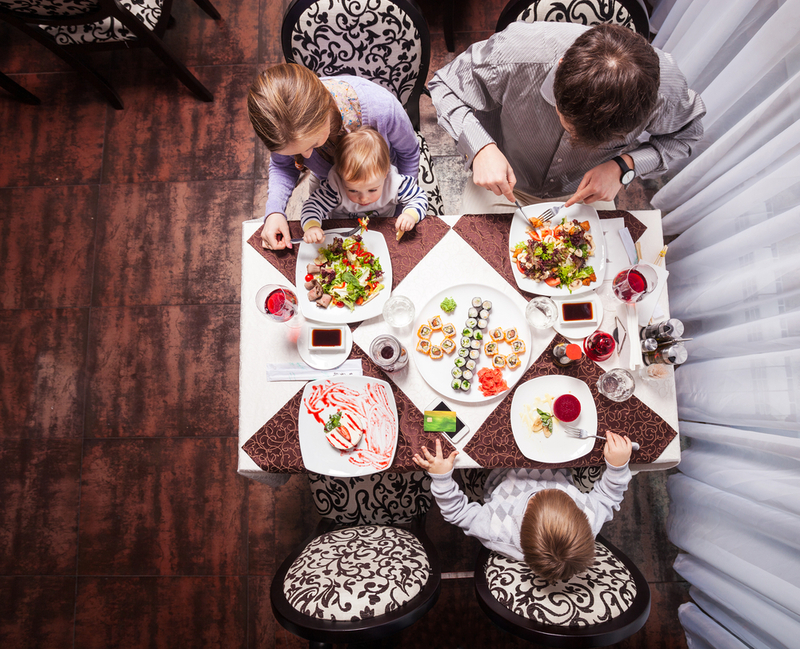 An early dinner also means avoiding overtired or over-hungry kiddos. Order first. Look up the kids menu ahead of time and order right when you sit down. This way the food comes fast with less down time. While you’re waiting for your food, explore around the restaurant. Do they have interesting wall art? Play a game of I Spy. Or the Alphabet Game—search for the letters of the alphabet if there are lots of signs or words on the walls. Come prepared. Bring snacks in case the food takes too long. Or a stash of toys that the kids don’t normally play with, so they don’t lose their luster and keep your child’s interest longer. Be prepared to leave. Any well-intentioned dinner out can go downhill quickly. Keep in mind you might need to get a doggy bag and abandon ship! Finally: Go out more often! The more you eat out with your kids, the better they’ll get on understanding the etiquette of eating out.